The A2 picks up on the classic aluminum style, then steps it up with a springless shock system and wheelie bar. Could this be too much of a good thing? Adjustable, foldable, and portable. Throw it in your backpack or mom’s hatchback and you’ve got wheels on the ground wherever you go. Great Value for the priceso simple to use. My Son loves this better than his bike. 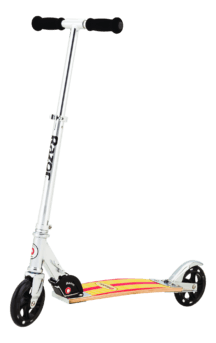 I would recommend this to any children around 5+ who wants a scooter. Had one of these as a kidSimple and rugged design, and can be stored almost anywhere. Awesome for kids, and is a proven design. I had one exactly like it when I was younger, I am in my 20s now and my siblings love the ones I bought them. Great Scooter for great priceLove this little scooter! It's a well built little scooter. I love the fact that it folds up and can be taken all over. My 11 year old loves it! I'm so glad I got this one.